Not all fat is created equal. Believe it or not, some fat is harder to lose than others. Sometimes, exercise and eating healthy just wont get you the results you want fast enough. Whether you have been engaging in a healthy lifestyle for sometime, or if you are looking to begin on your journey there is one supplement that can help you reach your fat burning goals. Quadralean by RSP Nutrition has been praised by amateur and professional body builders alike as one of the top fat burning supplement on the market. Whether you are looking to begin sculpting and strengthening your body, or if you are looking for a supplement to help with simple weight loss, Quadralean can give you the jump start that you need. What Can Quadralean Do For You? Unlike many fat burners on the market Quadralean is a stimulant free weight loss supplement. If you are not looking for stim-free specifically, we definitely recommend using a weight loss supplement WITH stimulants for the added weight loss benefit. Check our post here for the 10 best. Many people have had adverse reactions to fat burners that contain stimulants. Feeling jittery after taking other stimulant fat burners has been a turn off for many. Stimulant fat burners also give the user energy, however, the energy may only stick around for a short time. This can lead to a feeling of increasing tiredness as it leaves the body and can cause additional stomach discomfort for some. Quadralean can give you the clean energy that you are looking for without the jittery and overall uncomfortable side effects of stimulant fat burners. Quadralean contains all natural ingredients that help stimulate the body’s fat burning potential, without stimulating the central nervous system. The natural ingredients within Quadralean helps suppress appetite while aiding the bodies breakdown of fat stores by reducing the amount of fat cells in the body. Fat is then converted into energy which then causes the metabolism to rise. This will effectively burn fat while helping prevent the body from absorbing more fat. Also, the all natural ingredients will help the body reduce the production of the enzyme that causes carbohydrates to turn into fat. Conjugated Linoleic Acid (CLA): CLA is a fatty acid that is found in dairy products and meats. CLA is a non-essential fatty acid and has been shown to inhibit the body’s production of lipoprotien lipase, also known as LPL, which is an enzyme that transfers fat from the blood stream to fat cells. To get the proper amount of CLA in the body you would have to eat copious amounts of foods that are high in fat. This, in turn, would derail any clean eating diet.Quadralean contains 500 mg of CLA in each supplement. Not only does CLA help burn fat but it helps with muscle growth, improves HDL cholesterol (good cholesterol) which helps the body remove LDL cholesterol (bad cholesterol) from the blood reducing the risk of heart disease, has antioxidant properties and helps control blood sugar levels. Garcinia Cambogia: This natural ingredient has been praised for helping raise the body’s metabolism. However, conflicting evidence regarding the true wight loss effects of Garcinia Cambogia have been debated about since its inception. Some say there is little evidence to show that there is any significant weight loss when using Garcinia Cambogia alone, while other contribute weight loss to the included plan of diet and exercise. However, as with any weight loss supplement, eating properly and exercising boosts the effectiveness of supplements. Quadralean contains 500 mg of Garcinia Cambogia in each supplement. Raspberry Ketones: Raspberry ketones are known more widely as a food additive that increases the flavor and smell of some foods. Raspberry ketones are plant based and they contribute to a leaner body by increasing metabolism. There is also some evidence that the use of raspberry ketones can help regulate blood sugar levels and aid in breaking down fatty acids by increasing the hormone known as adiponectin which is produced in adipose tissue in the body. Each supplement contains 250 mg of raspberry ketones. QuandraLean Carntine Blend: Carnitine has been used to boost weight loss and lean muscle mass for quite some time. It is made up of lysine and methionine which can be found in fish, dairy products and red meat. Carnitine transports fatty acids when the body breaks down fat and turns fat into energy. The blend contains acetyl-l-carnitine which increases energy and helps break down body fat, carnitrine tartrate that helps reduce tissue damage and aids in the repair of tissues after workouts and propionyl-l-carnitine which works to help the body combat fatigue. Many people of varying levels of exercise, bodybuilding and weight loss have weighed in on the effects of using Quadralean. Ratings for Quadralean have been anywhere from 8.7 to 10 out of 10. Most people have raved about how Quadralean does help to decrease appetite, however, some bodybuilders say that this effect is hard to gauge for them because they eat up to 6 meals a day per their own routines. Many who have been skeptical about using fat burners in their workouts have tried Quadralean and they have noticed a significant loss in body fat. They have also said that unlike other stimulant fat burners there have been no adverse side effects like headaches, jittery feelings or feelings of quick, onset fatigue. Many have spoken of a clean energy feeling that they don’t get with stimulant fat burners. Some have commented on their increased strength in the gym as they go through their daily workout routines. Some people stack Quadralean with other supplements according to their workout plans and overall goals. Many have said that Quadralean works into their overall plan very well. When other fat burning products have failed many have noted that Quadralean has helped them get over significant plateaus with their fat loss. Users of Quadralean have seen more muscle definition and a leaner body mass. Depending upon your body type, workout routine, diet and overall genetic make-up Quadralean may work differently for you. With some people results came quickly, while with others it took a few weeks. There were very few negative results noted when using Qadralean. The all natural ingredients have shown no adverse side effects. Some who have tried Quadralean have stated that their energy decreased, while others stated that they saw no significant changes at all. Depending upon your level of overall health, goals and workout routines, Quadralean has produced many positive results. Customer Reviews have been relatively positive with only a few negative statements about Quadralean. As stated before, depending upon the person Quadralean can affect weight loss, energy and overall definition in many different ways. Quadralean does not offer a money back guarantee at this time. However, there are many Buy 1 get 1 deals that are very appealing. Cheapest options you will find for Quadralean is on Amazon.com and Bodybuilding.com. 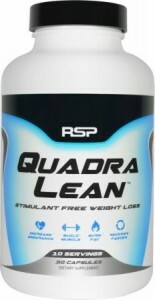 You can also purchase Quadralean from the RSP Nutrition website at www.rspnutrition.com. Their site also offers a store locator that can help you find a retailer near you. RSP Nutrition is a supplement and nutrition company in Miami, Florida who’s main goal is to produce quality products to help you with your weight loss and fitness goals. They thrive on helping people live more active and healthy lifestyles. They offer a wide variety of supplements and other products for any workout level. There are literally hundreds if not thousands of other weight loss supplements on the market. Quadralean differentiates by removing stimulants. This is a great option if you are sensitive to stimulants, however, stimulants such as caffeine, green tea, and hordenine have been clinically proven to burn fat. If you do not have any reason for stim-free, definitely check out our list of the world’s best selling fat burning supplements here. Hydroxycut and Thermakor are two great alternatives, however, both are contain stimulants for extra fat burning effectiveness. Overall, Quadralean has shown that it is a great alternative to stimulant fat burners. The all natural ingredients are effective and free of side effects. Positive reviews by professional bodybuilders, amateur bodybuilders and those who simply work on a healthy lifestyle daily have had overwhelmingly positive results using Quadralean for weight loss, increased energy, faster recovery and a leaner, more cut physique. Simply put, Quadralean is a solid product that can offer enhanced weight loss and fat burn. What other fat burners have you tried? Let us know in the comments below! I have been taking this product for 2 weeks. I had to have labs drawn and my cholesterol came back high. I’m only 23 and the doctor seemed concerned. Could taking this product affect my lab results? Did you ever find out if Quadra lean caused the high cholesterol? I have high cholesterol to begin with . I just bought a bottle and took my first dose this morning. Then I saw this article and your comment. Can I take caffeine tablets along with quadralean before workout in the morning ?